LAS VEGAS, Nev., Sept. 19, 2017 (SEND2PRESS NEWSWIRE) — Most people know when they are going to get their next meal or where they are going to lay their head to sleep. That is not the case for over 9,000 homeless men, women and children in the community, says Innovative Plumbing Pros LLC. Las Vegas has the fourth highest rate of homelessness in the U.S. Many of these people are veterans, mentally disabled, or battered women (with young children) and they need our help! The Las Vegas Rescue Mission is a non-profit organization who has been helping the homeless people in the community since 1970. They have grown throughout the years and now provide over 30,000 meals a month to the less fortunate members of Las Vegas. LVRM also offers shelter for many people who would otherwise be living in the streets. Additionally, the Mission’s non-profit thrift store uses their proceeds to aid in the care of the displaced. 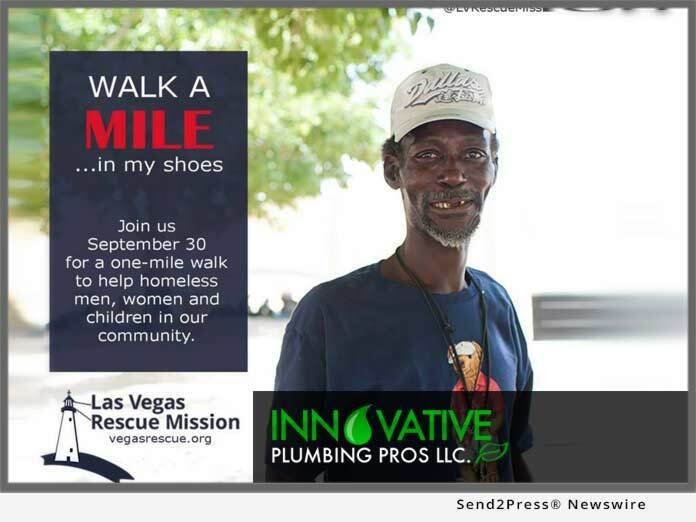 Innovative Plumbing Pros LLC is partnering with the Las Vegas Rescue Mission and sponsoring the 6th Annual Walk a Mile in My Shoes event. The event takes place on September 30, 2017 in the Las Vegas Review Journal parking lot. Learn more about the event and Las Vegas Rescue Mission at: http://www.vegasrescue.org/events/6th-annual-walk-mile-shoes/. From now until September 28, 2017, these plumbers in Las Vegas will be collecting monetary donations for the occasion and 100 percent of the earnings go directly to the Las Vegas Rescue Mission. Innovative Plumbing will also be making rounds to collect clothing and household items that could be sold at the Mission’s thrift store. Please call their office at 702-672-7567 if you would like to schedule a pickup! Learn more about Innovative Plumbing Pros LLC at: http://www.innovativeplumbingpros.com/. Innovative Plumbing Pros LLC., specializes in commercial and residential plumbing services. We approach every job with the dedication and expertise that our clients deserve and we strive to achieve customer satisfaction with every project. Innovative Plumbing takes pride in routinely surpassing expectations by providing a reliable diagnosis from expert professionals. Innovative Plumbing Pros is a licensed Las Vegas plumbing company in the state of Nevada in accordance to NAC 624.190.